Thin strands of volcanic glass drawn out from molten lava are called Pele’s hair. They are named after Pele, the Hawaiian goddess of volcanoes. “Pele’s hair” is the internationally recognized (geological term) for such volcanic glass threads, and is one of Hawaii’s worldwide influences. The strands are formed by the stretching or blowing-out of molten basaltic glass from lava. Pele’s hair is often carried high into the air, and wind can blow the glass threads several tens of kilometers from a vent. 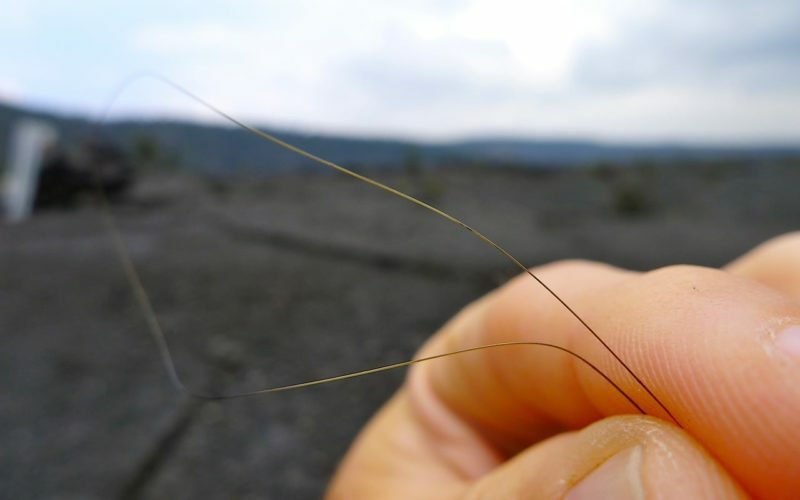 You can find these hairs all around the active craters in the Hawaii Volcanoes National Park and in the Ka’u Desert. A good place to look for them is on big lava rocks. Pele’s hairs often get stuck on these just like real hairs get stuck on your clothing. If you are up for a seven-mile hike (out and back), you can try the Mauna Iki trail, which is known for the presence of Pele’s hair. In the short video below you can see how Pele’s hairs move in the wind, just like normal hair! 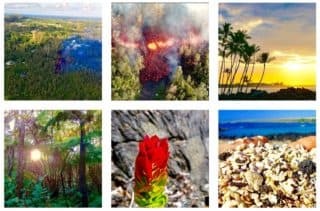 Back to our Big Island factsheet.